On some days David Locke and his 16-year-old son trod across the African savannah for hours looking for acacia trees, noting seedlings, or examining mature plants for damage. Other days they would hike 6 to 10 miles through the bush while they counted the animals they saw — elephants, impala, and large herds of zebra. They were often up and out by 6:30 a.m. After lunch they entered the data that they had collected during the long morning in a computer. Then they could relax. “You can go to the beach and do nothing and be relaxed, or you can go and be challenged,’’ says Locke, 50. For some people, time dozing by a pool or puttering around a golf course can stretch out like an existential nightmare. Relaxing isn’t all that relaxing for everyone. Even a hyper week of kayaking, hiking, and horseback riding can feel like a waste of time for some. They crave to be productive, even with their free time, whether that means learning a new skill, contributing to scientific research, tidying up a park, or immersing themselves in a different way of life. “These people are after more than a suntan and a cocktail for their time off,’’ says Kristen Kusek, director of public relations for Earthwatch, a Boston-based nonprofit that recruits volunteers to assist with environmental research around the world. For busy-bee types, there are a number of ways to pack vacation days with structure and work, from driving cattle on a Montana ranch to studying winemaking with a vintner. Earthwatch has been pairing travelers with scientific studies for 40 years. For a lump sum that includes accommodations, even the least scientific-minded person can help a research team dig up mastodon bones in South Dakota or monitor pink dolphin populations in Peru’s Yavari River. Locke and his son, who live in Manchester-by-the-Sea, were part of an Earthwatch team studying black rhinos in Kenya. They learned to measure tree damage — and what to do should they cross paths with a lion. Earthwatch funds 60 projects in 40 countries, Kusek says, and volunteers are instrumental in gathering data. A few expeditions, such as the coral survey at San Salvador Island, require participants to be scuba certified, but otherwise volunteers are taught the skills they need, which can be as simple as unearthing pottery shards. Days are full on the expeditions, Kusek says, but demands and accommodations vary. For the mammoth dig, one of Earthwatch’s easiest expeditions, participants stay in a hotel in Hot Springs, S.D. In contrast, volunteers with the Australian frog study set up camp in the bush. Trips range in price from $595 for a three-day expedition to England to $5,195 for an 11-day trip to Canada’s MacKenzie Mountains. For vacationers eager for hard physical work, there’s plenty of that to be done on a cattle ranch. Karen Searle of Montana Bunkhouses Working Ranch Vacations pairs travelers with one of 20 ranches, which range from small to 450,000 acres. Some take small groups, others take one or two guests at a time. All the ranches have horses to be ridden and chores to be done, such as helping out with delivering baby goats, fixing fences, or branding colts. But they also have campfires, fishing, and swimming holes. “I like to send people to a ranch that will get them good and tired for a few days and then take care of them for the rest of the week,’’ Searle says. At the Barron Ranch, a fifth-generation operation run by Wanda Wilcox and her family, guests help round up stray cattle and move the herd to their summer range. Wilcox’s two sons, former rodeo competitors, also teach guests how to rope. 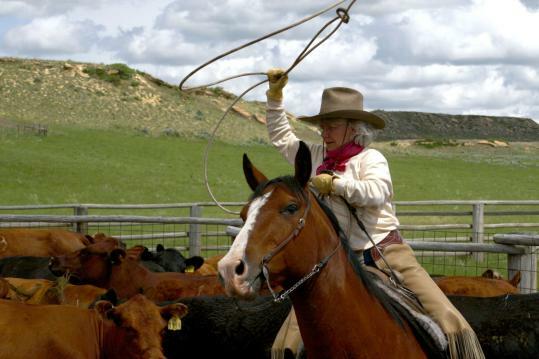 Prices at each ranch, which include meals and accommodations, range from $1,500 to $1,900 for six-to-seven-day trips. Some people may want to learn a new trade as they travel. Brian Kurth started Vocation Vacations as a means for folks to explore new careers by spending one-on-one time with a mentor in the field. But about a quarter of the people sign on for a true vacation. They want to follow around a beer brewer or chocolate maker just for kicks. Kurth says the true vacationers gravitate toward the more creative professions, such as cooking, music, photography, and theater. He recently added a film producer to his list. Days with the mentor run about eight hours but can be longer, especially if a traveler decides to shadow the wedding photographer. “That is one of the intense ones that makes even me nervous,’’ Kurth says. The average $900 cost of a Vocation Vacation, which ranges from two to four days, covers only the training, not meals or accommodations. The package includes a career counseling session at the end, which Kurth says the vacationers tend to do just for fun as well. The Sierra Club has been in the business of putting vacationers to work since 1958. The club’s service outings send people to a range of parks around the country and abroad to clear trails, pull out invasive plants, survey elk populations, or help out with archeological surveys — basically doing whatever a park needs done. As with Earthwatch trips, the service outings range in degree of difficulty. In August a group will move and crush rocks to stabilize a trail in California’s John Muir’s Wilderness. In contrast, this spring another group heads to Maryland’s Antietam National Battlefield to clean historic buildings and paint fences. Sierra offers 80 to 90 service outings a year, most of which run about a week with one or two days free. Most outings cost under $700 and include meals and accommodations, though that might be camping, as in bring your own tent. Amy Sutherland can be reached at amysutherland@mac.com.